ST. AUGUSTINE, was born on November 13 in the year 354 at Tagaste, a small town of Numidia in north Africa, not far from Hippo. His parents were of good position, but not rich; his father, Patricius, was an idolater, and of a violent disposition; but through the example and prudent conduct of St. Monica, his wife, he was baptized a little before his death. Augustine went to Carthage towards the end of the year 370, in the beginning of his seventeenth year. There he took a foremost place in the school of rhetoric and applied himself to his studies with eagerness and pleasure. Soon he entered into relations with a woman, irregular but stable, to whom he remained faithful until he sent her from him at Milan in 385; she bore him a son, Adeodatus, in 372. St. Monica, having followed him to Milan, wished to see him married, and the mother of Adeodatus returned to Africa; leaving the boy behind; but neither marriage nor single continence followed. And so the struggle, spiritual, moral, intellectual, went on. St. Augustine was baptized by St. Ambrose on Easter-eve in 387, together with his dearly loved son Adeodatus, who was about fifteen years of age and was to die not long afterwards. In the autumn he resolved to return to Africa. Accordingly he went to Ostia with his mother and several friends, and there St. Monica died in November 387. In 395 he was consecrated bishop as coadjutor to Valerius, and succeeded him in the see of Hippo on his death soon after. Throughout his thirty-five years as bishop of Hippo St. Augustine had to defend the Catholic faith against one heresy or another. 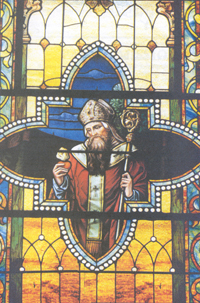 St. Augustine produced many writings. He began his famous Of the City of God in 413 and completed it in 426. Theologians consider Of the City of God Augustine’s greatest theological accomplishment, and it remains his second most widely read work after his popular Confessions. With sincere humility and contrition Augustine lays open in the Confessions the errors and moral wanderings of his own past conduct. Turmoil filled the last years of St. Augustine’s life. The strength of his body declined daily and hourly, yet his senses and intellect continued sound to the last. He calmly resigned his spirit into the hands of God on August 26, 430. He had lived seventy-six years and spent almost forty of them in the labors of ministry.